We searched high and low. 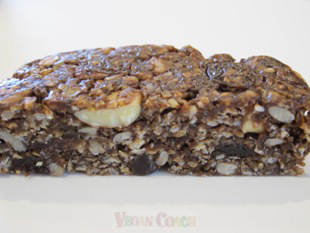 So many "nutrition bars" out there have dairy or eggs in them, and most of us don't want to eat a sugar-, preservative-, or GMO-filled bar. 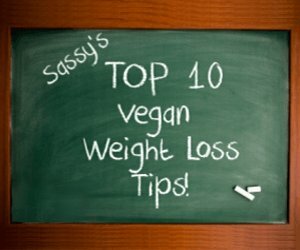 Find a bar that is Vegan, Organic/Non-GMO, low to none of the bad stuff, and BIG on taste and nutrition. We gathered up 21 vegan bars across the land. 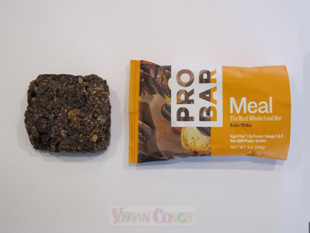 First, we took photos of the outside of each package before opening, then we cut each bar in half and took a photo so you can see what they look like inside as well as outside. We quickly realized what was most important to us in a health food bar. 2. Good Stuff: It had to contain mostly whole foods while also lacking preservatives/unpronounceable ingredients. 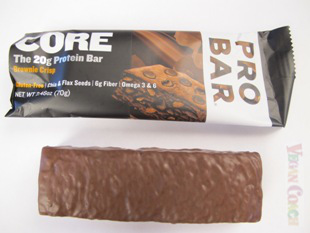 For example, if a bar contained Soy Protein Isolate, we delivered an automatic score of "3" out of 5. So again, if a bar didn't earn a score of "5" for these two points, they didn't make it into the final vote. Those bars that earned a score of "5" for the above two points (Organic/non-GMO and filled with Good Stuff) moved on to the final showdown and appear in red boxes below. A green arrow pointing up ( ) indicates it is higher than the average of all bars to the positive (i.e. more protein). A red arrow pointing up ( ) indicates it is higher than the average of all bars to the negative (i.e. more sodium). A green arrow pointing down ( ) indicates it is lower than the average of all bars to the positive (i.e. less sugar). A red arrow pointing down ( ) indicates it is lower than the average of all bars to the negative (i.e. less protein). If you see a red and green arrow together like this ( ), this is the median point for this category. While we provide the numbers of carbohydrates below for your convenience, we didn't make the decision as to what a "good" amount of carbs means. That's because rating carbs in vegan food doesn't make sense since it's an inherent part of the diet. But again, it is provided for you in case you're watching your carb intake. So on that note you'll find a black up arrow ( ) or a black down arrow ( ) to simply indicate whether it is above or below the average for all bars we tested. Two side-by-side black arrows ( ) indicates the median point for this category. We'll also point out the highest and the lowest of each category. We nearly always agreed on taste, but if you see a number followed by an "S", it denotes Sassy's score. If it's a "J", it's Jeff's. We hope this entire exercise will lead you to trying a new bar you've never tasted -- or perhaps solidify your resolve to continue with your current fave. We'd like to say, for the record, how thankful we are to all of the companies out there (whether listed here or not) that provide nutritious and tasty VEGAN food bars for the masses. 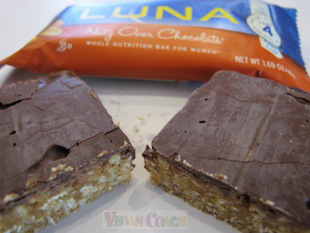 We had enjoyed Luna bars for years mostly because they have so many flavors to choose from. But it wasn't until we started doing comparisons that some interesting points stood out for us. They have many, although not all, organic/non-GMO ingredients so they get a 4 rating for that. But upon closer inspection, one of the main ingredients is Soy Protein Isolate. 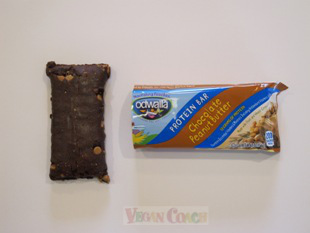 We recommend avoiding Soy Protein Isolate for the reasons mentioned above. 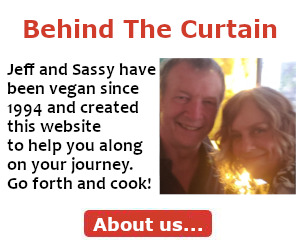 Website: ClifBar.com. Clif pretty much dominates the food bar scene, so it was difficult to NOT test a few of them. 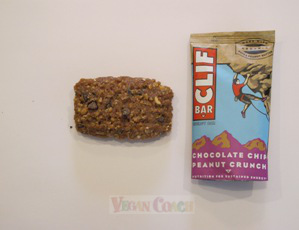 In fact, the following 4 bars are also made by Clif! 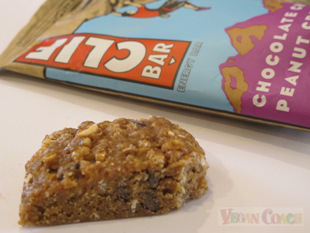 We had never tried a Clif Builders Bar before our trials, but we enjoyed it. It tastes very much like a Luna Bar, also made by Clif. It had a nice crunchy taste, although Sassy thought it had an odd aftertaste. We like that it had some organic/non-GMO ingredients. As you can see the protein is highest in its category. 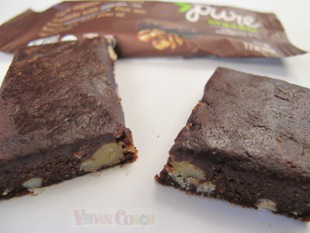 If you are looking for protein, this is it at 20 grams in this big heavy bar! 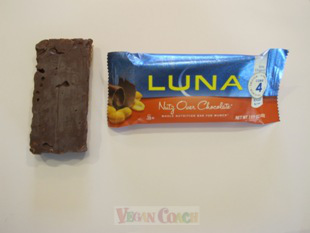 But just as with the Luna Bar, the protein is mostly derived from Soy Protein Isolate. 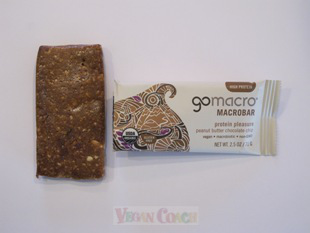 This bar was quite substantial and chewy, and the price is great. 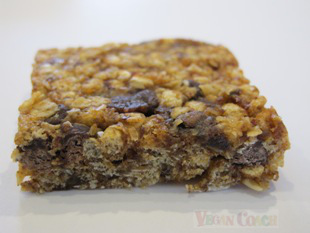 We tried the Chocolate Chip Peanut Crunch and enjoyed it more than we thought we would. It is a bit high in the sodium and sugar departments, though. 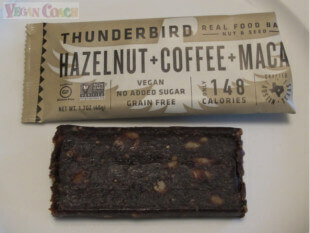 These bars are also loaded with organic/non-GMO ingredients which we did not know until we were chomping on it and started reading the label. We love that! 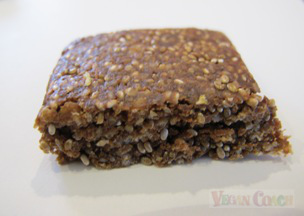 But once again, Soy Protein Isolate makes an appearance as one of the major ingredients in this bar so we couldn't rate it higher than a "3" in Good Stuff. 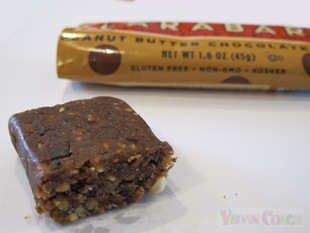 We tried the Chocolate Almond Coconut flavor, and Sassy enjoyed this one. It was chewy, but the nuts inside also gave a nice crunch. It was sweet, but not overly so. Jeff didn't like it quite as much. It is a Clif brand (yet again! ), but this one is 100% organic with the kind of ingredients on the label that we like to see because we knew what everything was. 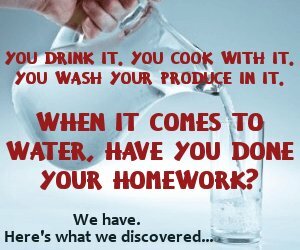 No scientific compounds in here, just natural whole foods. With scores of "5" in Organic/non-GMO and Good Stuff, this will be a contender for the win. 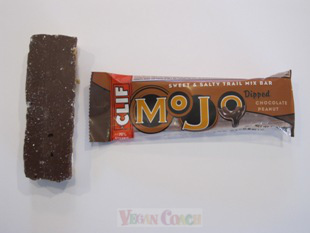 These two Clif Mojo bars were one of the first commercial bars that we really loved, especially for road trips. We never really looked into the ingredients back in those days because they tasted too dang good. We eventually became practically addicted to them! 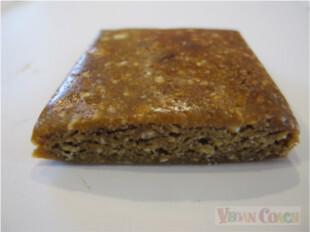 But after a year had to stop because when we did begin to examine the ingredients of the bars we ate a little more closely, we found other bars that are just as good with better ingredients. The price is nice and low -- but then again the size of the bar is less than the average of all bars tested. 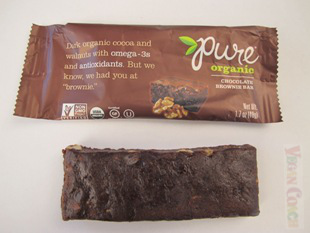 While there are some organic/non-GMO ingredients, many of them are not, and along with various oils and non-whole foods, does not make for the most nutritious bar. Once again, Soy Protein Isolate. Bummer. We were not expecting this bar to taste as good as it did, although the sugar is highest in category. It had a delicious date-like flavor to it. It was moist with a nice chocolate chip crunch surprise. The protein is derived from brown rice. 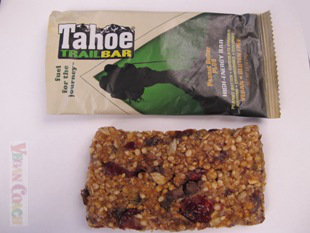 We did not like the bland taste of this small bar at first, which is most likely due to the low sugar and sodium content. Our second bite, though, was much better. It just took some getting used to. The selling point of this bar is how very high it is in Omega 3s. The bar is truly a whole foods bar, though, and most (but not all) of the ingredients are organic. We tested the Chocolate Banana flavor. It's thin and crispy with a lingering aftertaste. The one we sampled was quite true to its name as the banana flavor was very strong. 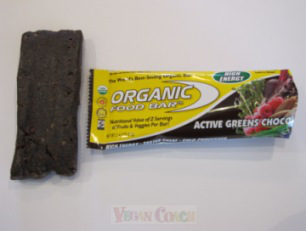 This low-fat bar has mostly whole food ingredients, although none are organic (but they never claim to be an organic bar). 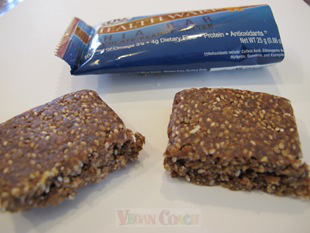 And once again we have a bar which includes Soy Protein Isolate. Website: Unavailable, but they have a Facebook page if you'd like to check them out. 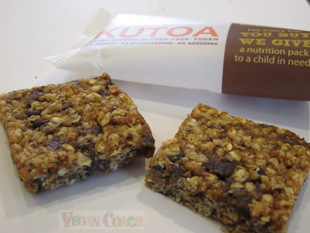 These bars are very nutritious and very low in "the bad stuff". 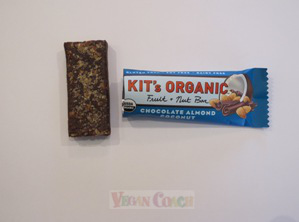 The ingredients are truly top-notch and all organic, which is why it likely comes with the highest price tag of all bars we tested. 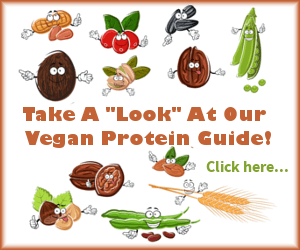 The protein is derived from brown rice and pea, both excellent sources of concentrated protein. The bar was super dense and filling with a taffy-like chewiness. 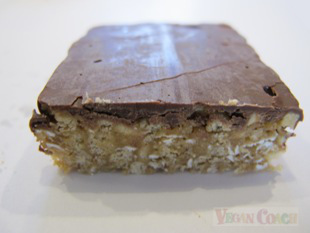 Unfortunately, it is the low sugar and sodium that also makes the bar rather tasteless, which is a bummer because it is so darn healthy for you! But it does not taste bad, either. We think you might want to choose a flavor that appeals to you and see if you like it. 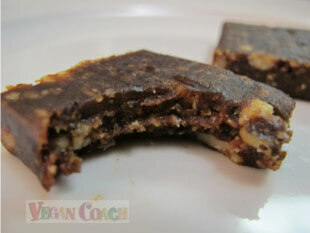 The first thing that comes to mind about these bars was chewy. 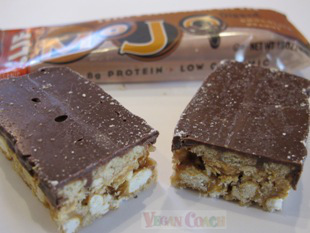 If you like a crunch, this is not the bar for you. We did think that it went quite well with our coffee, though. But, we needed it to help get the bar from sticking to our teeth. It does have some organic/non-GMO ingredients, but not enough for our standards. That said, it definitely packs some nutrition and does have whole fruit and cereal grains. We noticed that all the flavors vary quite a bit in carbs, sugars, and sodium content. We tried the Chocolate Peanut Butter, but we found out later that it contains milk even though it was not mentioned at all on the label! So, we're slightly bummed about that. This flavor in particular contains Soy Protein Isolate, which means an automatic score of "3" in the Good Stuff category. 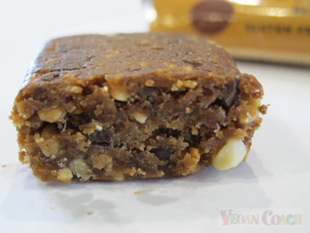 Further research shows that most of their bars, however, do not contain Soy Protein Isolate, but since we didn't get a chance to taste-test any of them our results are inconclusive at this point. If their label had clearly stated that it contained milk, we would have tried a different flavor. 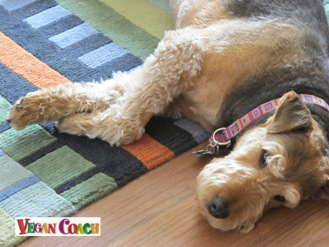 We interrupt this page for a special shout out to Gypsy. Thanks, girlfriend, for being so patient (and such a lady!) 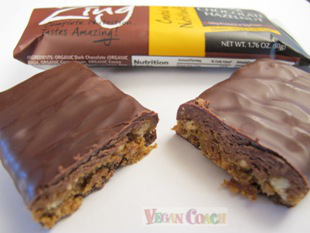 while we taste-test our bars! 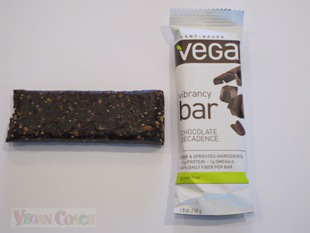 With a great name like Vega, and us being vegans, we were surprised we hadn't tried this one before. First and foremost let me just state that the founder of Vega, Brendan Brazier, rocks. He's a former professional Ironman triathlete and two-time Canadian 50km Ultra Marathon Champion. 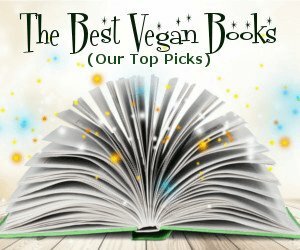 I love his books and how he brings veganism into the spotlight for professional athletes. It contains a couple organic/non-GMO ingredients but not enough to earn it a "5". Interestingly, the label in the U.S. shows some organic/non-GMO ingredients, where the label in Canada shows none. This is likely because the organic labeling in Canada is a little different than here in the U.S., and this is quite common in many products out there. Still, it is filled with Good Stuff like Brown Rice and Pea Proteins as well as so it gets a "5" in that category. While it did have a smooth texture with a nice light crunch to it, it was the flavor that we just could not get past. 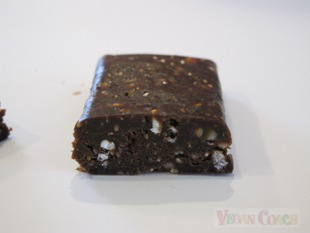 Unlike other bars that had little flavor, the Chocolate Decadence bar we tested had a strong chicory root taste we did not enjoy. If you love chicory, though, this is definitely the bar for you. This bar is meal in itself. I mean, the bar is super heavy, so perhaps it makes sense that the calories, carbs, and fats are highest out of all the bars we tested. It contains mostly organic/non-GMO ingredients, although not all so it didn't earn a score of "5" in that category. Most of the ingredients are excellent whole foods, but since there is a smattering of non-whole foods it didn't earn a "5" in the Good Stuff category either. It has a great mix of textures that makes it fun to eat. 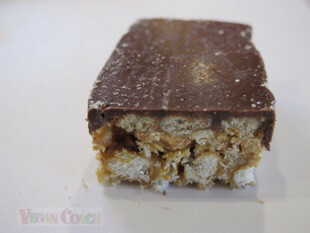 There are crispy parts, chewy parts, but nothing that makes it boring like a mono-textured bar that is the same thing over and over. And the flavors are superb. It reminded us of a healthy dessert that you might make in your own kitchen. Sassy's favorite flavor is Superberry & Greens. Jeff's fave is Double Chocolate. We were drawn to this bar as they claim that each bar has nine or less ingredients, which is always going to be a good thing. And the bars are simple and not filled with a laundry list of chemicals earning it a "5" in the Good Stuff category! PLUS, they may not be organic, but they're non-GMO which earns it a "5" score in that category! Unfortunately, this won't be a contender for the win. Why? Because we noticed later (after we ate it) that the label said "may contain milk from chocolate chips." May? Oy! We wish companies knew exactly what they are making. But, then again, they never did make the claim to be vegan, just that they are "kosher." That said, the bar was pretty good tasting and we enjoyed it. Yummy, was our first impression after biting into one of these. 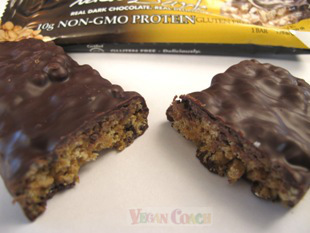 We really enjoyed this gluten-free bar that tasted similar to an Almond Joy. This is a heavy, substantial bar. While it is vegan, we really hoped it was made up of organic/non-GMO ingredients, but since it wasn't it earned a "0" in that category. 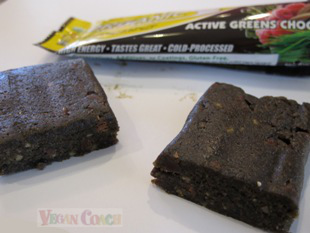 Most of the ingredients are whole foods, but since a couple were not we rated it a "4" in the Good Stuff category. It is also rather high in sugar and sodium, which may be another reason they tasted so dang good! 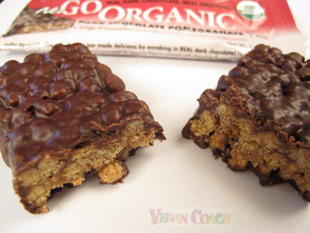 If they could stuff their bar with Organic/non-GMO ingredients, this would likely become one of our all-time favorite bars. It's delicious. 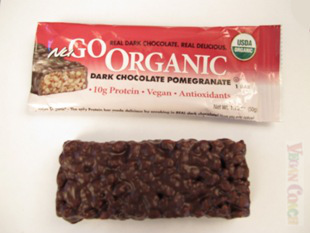 NuGo has three organic bars, Dark Chocolate Almond, Double Dark Chocolate, and this one, the Dark Chocolate Pomegranate. While this Organic line contains all organic/non-GMO ingredients earning it a "5", it DOES have some ingredients that may not be of the highest nutritional value, such as the dreaded Isolated Soy Protein which brought it down to an automatic "3" in Good Stuff. Claim To Fame: Uses real dark chocolate. Gluten-free. 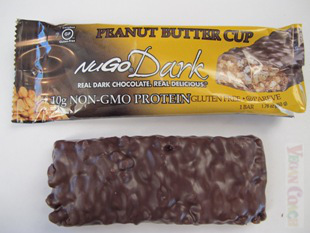 It seems the biggest selling point (in Nugo's own words) is that they're gluten-free. 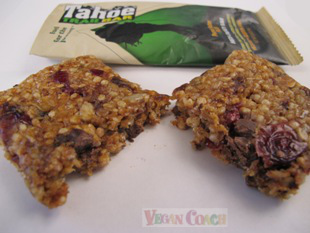 They are quite tasty, but not as good as their organic variety of bars (above). 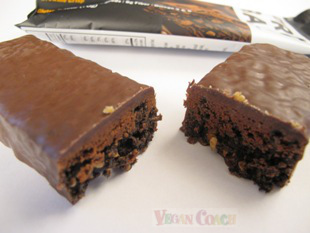 NuGo Dark is made with Soy Protein Isolate which is a bummer and earned it an automatic "3" in the Good Stuff category. Although it IS GMO-free which earned it a "5" in that category. We liked the textures in it, crispy, creamy, and crunchy. But it did possess a bit of an odd lingering aftertaste. 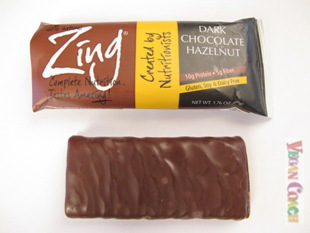 Zing tasted very much like a candy bar that is very heavy on the coconut and cherry flavors. We enjoyed it. Some, but not all, ingredients are organic. But ALL of the ingredients are non-GMO! Unfortunately, it won't be a contender for the win because it didn't earn a "5" in the Good Stuff category. That's because not all of the ingredients are whole foods (although some of them are). 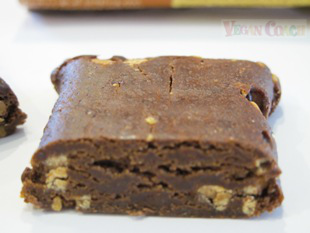 If you love brownies, you will love this rather small bar. 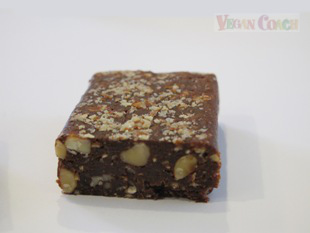 Although Jeff is not a big fan of brownies because he likes crispy and crunchy textures, he had to admit this was a delicious bar - soft and chewy with the nuts giving a bit of the occasional crunch. Since we taste-tested this bar, we have tried the other flavors and they are ALL completely delicious. If you're watching your sodium intake, then this is the bar for you since it's lowest in the category for all bars tested. They certainly live up to their name as all the ingredients are organic and pure whole foods. The taste was great with three unique layers that really blended together in a nice mix of textures. It reminded us of a chocolate cake with a bit of a crunch. 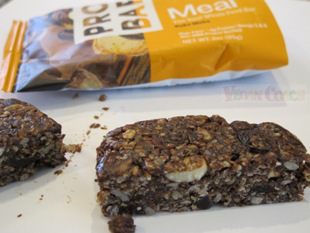 This entry by Pro Bar does have some organic/non-GMO ingredients, but not many so it only earned a "2" in that department. 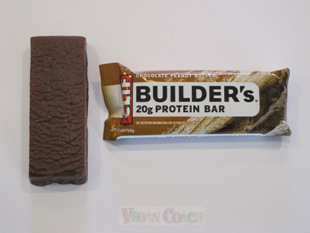 It's a nice-sized bar with a high protein content. It contains Soy Protein Isolate as well as fractionated palm kernel oil (meaning a higher saturated fat content) so it could earn no higher than a "3" in Good Stuff. And as you can see, it is also highest in sodium out of all the bars we tested. 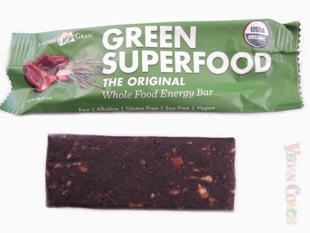 Claim To Fame: Superfood energy bar. No sugar added. Raw. Cold processed. 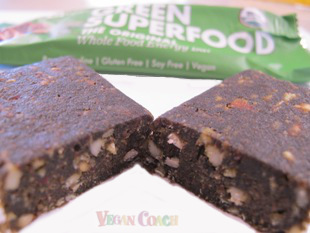 With one exception, the Green Superfood bars are as good as you can get, from a nutritional standpoint. 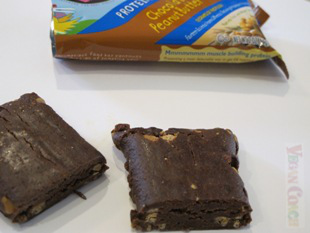 We originally were going to sample the Original and the Chocolate Peanut bar. 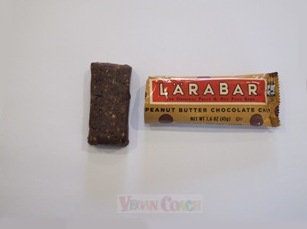 But when we got them home, we noticed that while the Original bar is organic and vegan, the Chocolate Peanut bar was neither. 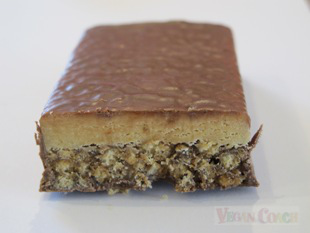 Back at the store we examined two other bars they offer, and found them to be organic vegan, so the Chocolate Peanut bar is most likely their only offering that does not qualify for this study. 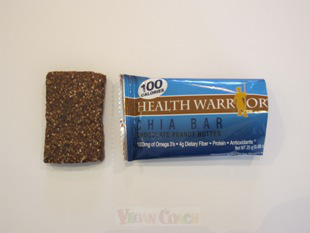 Unfortunately, although the Original bar is superior in nutrition and quality, we didn't really care for its taste. 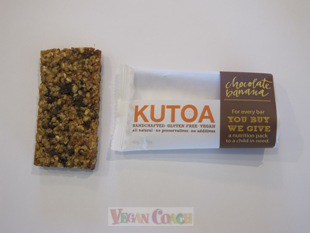 We thought, to be fair, to try a couple of their other bars which we discovered were organic vegan: Sweet & Savory Almond, and Chocolate Chip Coconut. We hoped that maybe these two flavors were better than the Original. 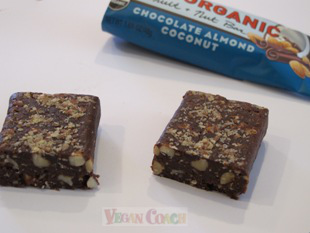 We actually loved the Almond version, which tasted like a salted nut roll - although it was even more expensive (same price per bar, but only 45 grams which comes out to more than 6.5¢ per gram, making it the most expensive bar in this study). 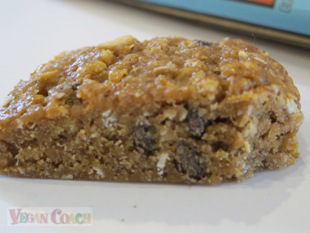 The chocolate chip coconut was way too coconutty for our tastes with a strong aroma that kind of permeated our nostrils. 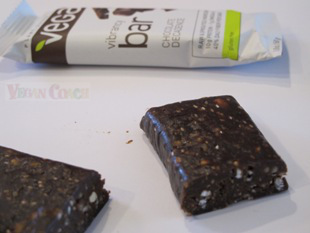 Claim To Fame: 100% whole food bar. No added sugar. Grain free. Thunderbird sent me samples of their bars. I loved them. And after they were all gone, I wanted MORE but didn't want to seem like a little piggie. So I went to the store to buy some for my own personal enjoyment. BUMMED to discover that nobody carries them here in Reno, Nevada! I went straight to their website to buy them. Two boxes; 30 bars total! And I can't stop eating them! 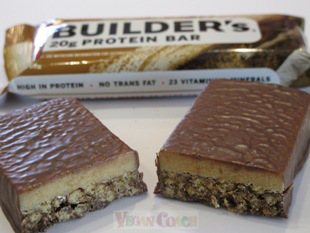 Guys, out of all the bars on this page, I have never liked any so much that I would go on to order a box of them! That's how special these are. If I could give it a score in the 10 category, I would. Well, obviously I COULD, but I made "5" the top score. So "5" it stays. Thunderbird makes quite a few bars; fruit and nut, or nut and seed. And bars for kids, too. They're ALL vegan. They're ALL non-GMO. And they're ALL made with ONLY whole foods. With NO added sugar. I love that so much. Our absolute favorite: Hazelnut-Coffee-Maca. You MUST try this amazing bar. It has crunchy bits of coffee and hazelnuts. The perfect mix of sweet and bitter. The other flavors we loved? 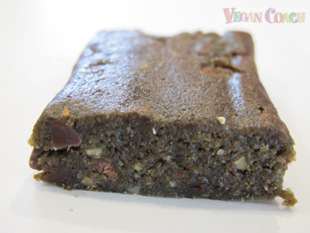 Cacao-Hemp-Walnut; perfectly sweet, tender and moist with its light mint flavor and light crunchy bits. Loved the Cashew-Fig-Carrot that tastes like a Fig Newton with VERY light and small crispy bits. The Pecans-Goji-Pistachios has a strong goji flavor and we loved the pistachios! As mentioned earlier, in order to move on to the final showdown a bar had to earn a score of "5" for both Organic/non-GMO ingredients as well as containing mostly Good Stuff (straight-up whole foods and no unpronounceables). Out of the 21 bars, only 6 qualified to make it into the final round. We have highlighted the best in each category with BOLD type. 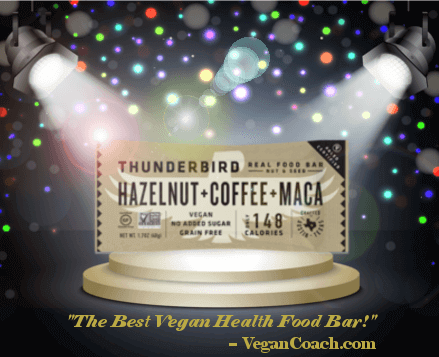 Congratulations Thunderbird Real Food Bars! Hope you'll agree that all of our finalists deserve a big round of applause! Feel free to leave a comment below. 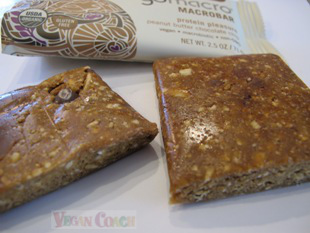 What is YOUR favorite VEGAN and ORGANIC/NON-GMO bar filled with GOOD STUFF? p.s. We received no monetary compensation from these companies in exchange for our reviews. "I love your website. 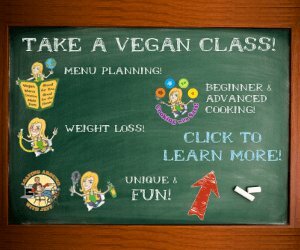 I have a 29-year old son who is vegan. I plan to send him to your site. I am sure he will find some useful ideas here. Thanks for such a great wealth of information!"